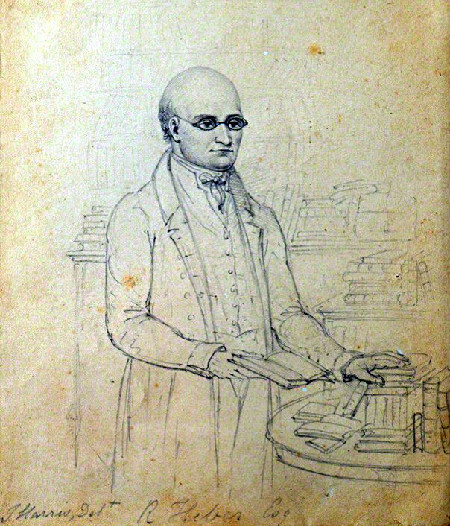 NOTE: Richard Heber (17741833) was an obsessive book collector, as perhaps is suggested in the pencil drawing of him. When he filled one house from floor to ceiling with his books, he bought another house; and when he filled that one, he bought another. By the time of his death, he had filled eight or nine houses with 145,000 books. He once said, "No gentleman can be without three copies of a book: one for show, one for use, and one for borrowers." In July 1825 Heber had suddenly left the country and resigned his seat in Parliament. In 1826 the John Bull newspaper reported, with heavy innuendo, that "Mr Heber will not return to this country for some time  the backwardness of the seasons renders the Continent more congenial to some constitutions." The report added that Heber had "an over addiction to Hartshorn"; hartshorn is a smelling salt made from ammonia and deer's antlers, but this reference blatantly alluded to a nineteen-year-old antiquary named Charles Henry Hartshorne who spent Christmas 1823 with the 48-year-old Heber and who lived with Heber in London for two months early in 1824. Rumours had been circulating since mid-1824, nearly two years before they were publicized in the newspapers. Hartshorne successfully sued the John Bull for libel, but Heber refused Hartshorne’s request to return to England to dispel the rumours about himself. The libel specifically about Hartshorne may have been untrue, but Heber's refusal to return from exile and defend himself is related to other rumours about his private life. Sir Walter Scott (with whom Heber had collaborated on Minstrelsy of the Scottish Border) said that Heber fled to Brussels after being warned by John Cam Hobhouse, Lord Byron’s confidante, that a warrant was being drawn up for his arrest. The specific claim was that Heber had made sexual advances to two young men at the Athenaeum, and the father of one of them threatened to bring charges against him. The affair was brought to the notice of Prime Minister Sir Robert Peel (for whom Hobhouse was under-secretary), and Peel and Hobhouse more or less forced Heber to leave the country to prevent the affair becoming public. Heber didn’t return to England until 1831, two years before his death in seclusion in Pimlico. Incidentally, Heber's library contained a copy of the Earl of Rochester's pornographic play Sodom: A Play by the E of R ... Antwerp Printed in the Year 1684, but it was destroyed by his executors after his death in 1833. COURT OF KINGS BENCH, Saturday, Oct. 20. (London Sittings, before LORD TENTERDEN and Special Juries.) LIBEL IN THE JOHN BULL.  REX v. SHACKELL. The trial upon the criminal information which had been obtained in this case some time ago, in this court, took place this day, before Lord Tenderden and a Jury, two of whom were special, and the rest supplied by tales, the other special jurymen not having attended. Lord TENTERDEN said, that he had heard several names of bankers called in the course of the sittings, none of whom had appeared. It was high time to teach bankers that they must attend to the service of the public as well as others. Call the summoning officer. He however was not in the way, and the box having been filled by the talesman, the cause proceeded. James Heare, solicitor for the prosecution, then produced a copy of the affidavit, in which the defendant swore that he was the Proprietor of The John Bull Newspaper, which was signed by the proper officer. Benjamin Turner, a clerk in the Stamp Office, produced copies of The John Bull Newspaper of the 7th and 14th May, 1826. John Newall was next called, and stated, that he lived in the service of Mr. Heber, at H Hall, near Shrewsbury. He knew that Mr. Heber went abroad on the 28th July, 1825. He has not returned since. The Rev. Doctor Dibdin, rector of St. Mary, Bryanstone-square, was next called: He had been acquainted with Mr. Heber 15 or 16 years; he knew him before he was Member for the University of Oxford; he was a man of great learning and talents, and was generally received in the first and best society; after Mr. Heber went abroad, he heard certain rumours circulated about him, of the most odious and infamous description  it was merely general rumour about unnatural crimes; no facts were specified: these rumours were assigned as the cause of his remaining abroad; saw the paragraph in the John Bull of the 7th of May, in which it was stated, Mr. Heber has not as yet returned. The backwardness of the season in this country renders a residence abroad more congenial to some constitutions. From the paragraph it appeared to him to refer to these rumours; he knew Mr. Hartshorn for four or five years; his age is about 25, and was at Cambridge when he became acquainted with him; he was introduced to him by Mr. Heber, and he often saw them together, generally in literary society; Mr. Hartshorn was a gentleman of a literary turn; recollected Mr. Hartshorn gong abroad with the Earl of Guilford, in 1825, about the same time as Mr. Heber; Lord G. has died within these few days; generally corresponded with Mr. Hartshorn when he was abroad, and his travels appeared to be in Italy particularly; his last letter to him was from Lucca; saw the paragraph in the John Bull of the 14th of May, containing the words, The complaint for which Mr. Heber has been recommended to travel, is said to be produced by an over-addiction to Hartshorn, and considered the words as applying to Mr Hartshorn. The witness instantly sent information of the circumstance to Mr. Hartshorn, at Lucca, and from which his last letter to the witness had been addressed, and Mr. Hartshorn returned to London in a few weeks after. Charles Henry Hartshorn was then called. He is a young man of handsome figure, and grave intelligent countenance. He stated, that he first became acquainted with Mr. Heber, in March 1821, at the Assizes at Shrewsbury. Mr. Heber was then High Sheriff; he afterwards dined with him, and was advised to cultivate the acquaintance by his relatives; he thought the acquaintance a great honour, and addressed to him a copy of Latin verses; in consequence of which Mr. Heber wrote to the witness directly, and he visited him in the neighbourhood of Shrewsbury. Witness soon after went to Cambridge; this was in October, 1824. Afterwards he visited Mr. Heber at his house in Westminster. Mr. Heber was a great collector of books himself, and the witness had a taste that way, and Mr. Heber introduced him to several booksellers. He became acquainted with several of Mr. Hebers friends, and witness continued to cultivate Mr. Hebers acquaintance till the latter left England; he thought it a credit and advantage to him, and such was the opinion of his friends. Mr. Heber was very poular amongst the best society, persons of rank as well as literature; he did not know of Mr. Hebers intention to quit England, nor did he know of it when it first took place. When he heard of it he had no idea of its object or intention. The witness left England with Lord Guilford in September 1825, at Lord Guilfords request, and with his mothers permission. Witness never saw Mr. Heber after he left England, nor knew where he was. He went with Lord Guilford to Corfu, where his lordship had founded an university. He was introduced by Lord guilford to the best company in Greece and Italy, and to the Turkish Ambassador, whom he afterwards visited at Constantinople. He proceeded on his journey back again to England with Lord Guilford, as far as the baths of Lucca, a few stages from Leghorn. Lord Guilford left him there, to keep company with a sick friend; and a few days after Lord Guilford left him, he received Mr. Dibdins letter, with the paragraph already mentioned. Two days before he received that letter, he had heard, for the first time, some rumours about Mr. Heber; but, from his knowledge of Mr. Heber he had not the least reason to give credit to the rumour. On reading Mr. Dibdins letter, he set off on his return to England the same evening. A friend accompanied him part of the way, and then left him. On his arrival in London he assembled his friends  Lord Guilford was among them  laid the matter before them, and has since acted by their advice in this transaction. The COMMON SERGEANT, for the defendant, said, it was quite out of the question to suppose that the character of the prosecutor required any vindication. Even had the imputation said to have been case upon him obtained the slightest degree of credit, the clear, open, manly, and satisfactory way in which he had answered all the questions that had been put to him by his learned friend, would place him at once beyond the reach of calumny; and he (the Common Sergeant) should be dong a violence to his own feelings, as well as to the instructions of his client, were he not to say that whatever might be the verdict, the character and conduct of Mr. Hartshorn stood above all suspicion, and that his honourable promptness and judicious conduct with regard to the most valuable of all earthly possessions  reputation and character  fairly entitled him to all the praise his counsel had bestowed upon him. The object of the prosecution was thus entirely gained; but he could not help wishing that his friend, the Attorney-General, had stated  what he was on other occasions always ready to state,  that the rule for the criminal information could not by law have been granted without an affidavit of the party charged disclaiming the charge; and upon this occasion that affidavit was made in the simplest language and most satisfactory terms; therefore Mr. Hartshorns character stood as high, and as completely vindicated, a twelvemonth ago, as it did then; and it was not necessary for him to have proceeded furthere than to make the rule absolute, unless it were for the sake of bringing the defendant to that condign and excessive punishment which the Attorney-General said it was necessary, for the sake of public justice, to be inflicted upon him.  The only question for the jury was, whether the defendant was guilty of publishing the paragraphs bearing the meaning and with the intention ascribed to them. It was hardly possible to have heard the eloquent and impassioned address of his friend without an inflamed state of feeling, which would not aid them in the judgment of the case; the speech was so contrary to that unimpassioned, cool, and almost mathematical manner in which criminal cases were usually put before juries, where their attention was only directed to the facts and the evidence. By the proceedings it was rendered impossible to avoid introducing the name of Mr. Heber under circumstances which were to be deplored, and that was another reason for regretting the unfortunate course the prosecutor had taken. Calumnies had been circulating for two or three years against Mr. Heber, without any attempt on his part to put them down, and it was an inevitable consequence of these proceedings that those unfortunate surmises would be revived. When Mr. Hartshorn had cleared himself on his oath, and the rule had been made absolute, it would have been surely better to have let the matter drop there  to have spared his patron, and his friend, and not let his name be brought into filthy discussion before the public  to have been contented with his own vidication, and to have suffered Mr. Hebers name, if possible, to sleep without having its recollection revived. But there might be other reasons for proceedings,  there might be the motive of correcting the press,  the desire of fighting with that tremendous giant. The learned counsel then read over and commented upon the two paragraphs, endeavouring to show that they did not necessarily bear the construction ascribed to them, but were capable of many other and innocent constructions; and contended, that although in civil actions, wantonness and carelessness might make a man equally responsible in damages to a plaintiff, as for a malicious act, yet that in a criminal proceeding, where actus non facit reum nisi mens sit rea [an act does not make a defendant guilty without a guilty mind], it was malice alone that could warrant a verdict of guilty; and even allowing the tendency, that tendency alone would not make out the intention. There was no proof of malice, the parties were not acquainted; and the effect of finding the defendant guilty, would be to convict him of malice, in order to punish him for negligence. The learned counsel referred to Mr. Foxs Act; and concluded by arguing, that whatever construction might be put upon the latter paragraph as far as referred to Mr. Heber, it could not reasonably bear the construction of imputing anything to Mr. Hartshorn. Lord TENTERDEN, in summing up, observed, that every individual had an interest in his own character; but that was not all,  the public had also an interest that persons who wantonly assailed character should be made amendable. The prosecution was, therefore, not merely to vidicate character, but also to satisfy public justice. However obscure the paragraphs were, yet, if they were intelligible to the friends of the party, although to no one else, they were libellous; but more so, if they were calculated to excite surmises in others. The Jury immediately found the defendant Guilty. Rictor Norton (Ed. ), "Richard Heber", Homosexuality in Nineteenth-Century England: A Sourcebook, 24 February 2015 <http://rictornorton.co.uk/eighteen/heber.htm>.